Passport to Dreams Old & New: The Awkward Transitions of Disneyland! The Awkward Transitions of Disneyland! It is the everlasting parlour game of the entire Disney community: Disneyland or Walt Disney World? 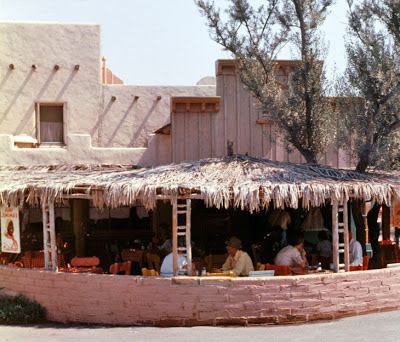 The whole business of comparing the two parks - or, let's be more specific, Disneyland and The Magic Kingdom - probably began late one October 1, 1971, over drinks at the Polynesian Village. I can hear the cries now, rising over the incessant tom tom of the luau and the reflected lights of the Southern Seas plying the Lagoon: "But Disneyland is the original!" It's still played today on message boards and at fan meetups. Over the years the rules on the ground have changed as Disneyland the Magic Kingdom have added hotels, attractions, and additional theme parks. Walt Disney World suffers from a surfeit of variety. Disneyland is Walt's park. We've all heard them before. In 1995 in Mouse Tales, David Koenig gave us the immortal zinger about Walt Disney World being nothing more than Disneyland with the expand button jammed, which is exactly the sort of thoughtless simplification that's just catchy enough to be endlessly repeatable: check the comments on this blog, you'll find it there. Let's stop and unpack that Koenig quote for a moment. The operating metaphor is a copy machine, a later 20th century modern convenience, which hits the point that Disneyland predates the existence of copy machines (Koenig is mum on the subject of mimeographs). It hits the point that Magic Kingdom is larger, yet it implies a process of thoughtless, mechanical reproduction, which of course does a great disservice to Walt Disney's confederates who built Disneyland and Walt Disney World. But it's stuck with us because in some ways it's at least ten percent true, and it's through phrases like Koenig's that we can find a key to unlock some of the deeper resonances and complexities of both parks. The real problem is that the entire question presupposes that there can ever be a satisfactory resolution, which there cannot, because despite their similarities, Disneyland and The Magic Kingdom operate in entirely dissimilar aesthetic registers. It only makes sense in a reductionist world where there can only be one Disney theme park and only one right way to build it. In reality the parks are more complimentary than competitive, and most people who visit one will never visit the other - that is why there are two of them, of course. Okay, I've said all of that and covered all of the bases, plucked all of the low lying fruit, so that we can go beyond the catchphrases and into some serious discussion. This is our point of entry today: to take old chestnuts and try to crack them to see what pops out. Our subject is Disneyland. Our topic: charm. The thing you hear all the time about Disneyland ultimately comes down to two words: magic and charm. Now, "magic" is a reappropriated marketing word, so it's really not helpful, but it points towards our second term, charm. Disneyland is intimate and human sized. Magic Kingdom is spectacular and epic sized. Everyone who's been to Disneyland knows it's got something special about it - but what it is, nobody seems to be able to say. Some say it's because it's the park Walt Disney built, which I think rather discredits all of the excellent work that's been done there since he passed away nearly a half century ago. Some think it's the way it was built - Disneyland uses more real plaster, brick and wood, Walt Disney World is largely made up of fiberglass and sometimes looks it. I was contemplating all of these things last week while in Disneyland doing nothing in particular, searching for the word that describes that special something. As Benjamin states, what is the ineffable, vaporous stuff that Disneyland has and the Magic Kingdom lacks - the "unique existence at the place where it happens to be"? The word I hit on was naive. I don't mean it in a negative way - I mean it in a way more closely resembling the original term for what we call folk art - naive art. It doesn't mean ignorant, it means something as it existed in it's pure, natural, untutored state. Is Disneyland naive? As the first of its kind, the first multimedia art experience which lifted the amusement center to a new height that a word had to be invented for it - a theme park - it must be. It may not be Benjamin's "perfect work", but it is certainly qualifies as one of his "major works" - in short, a cultural watershed. Yet Disneyland grew up as the men and women who made it were still making up the rules as they went, and so it grew in fits, starts, and stops. A fairly holistic theme park with lands that were siloed off from each other expanded, tacked new things onto areas where they were not meant to be, the areas bled together, additional demands for capacity forced development of unlikely spots, and urbanization of the surrounding area blotted out hopes of blowing the park out very far beyond its railroad tracks. Disneyland built things where it could, and so very often buildings are dropped down perfunctorily, only very rarely placed to achieve any specific pictorial effect. Depending on where you are, there can be three levels of themed design occurring around you on different registers. This makes Disneyland visually dense while retaining a somewhat prosaic thematic effect. This is what people mean when they say Disneyland is charming: it's a massive pile of ideas slammed down, one atop the other, with very little room to spare. This means that it's very common to find areas where one kind of texture or surface treatment just ends because it collides with another. This is what I mean when I say Disneyland is naive. Let's take a quick look at a pertinent area: the Hub. At the top is version one: the Disneyland hub. At the bottom is version two, the Walt Disney World hub. Both of these photographs are presented at the same scale. We can see that the actual central ring of pavement is roughly the same size, even if Magic Kingdom uses vastly larger sidewalks. I've cropped the image to right about where the Magic Kingdom hub and moat terminates, so that we can clearly see here how, in the space Magic Kingdom uses to slowly introduce the various lands and include spacious lawns and trees, Disneyland has included The Plaza Inn, Plaza Pavilion, Enchanted Tiki Room, Tahitian Terrace / Aladdin Oasis, the entire queue of the Jungle Cruise, half of Adventureland (all of it in 1955), most of Frontierland, The Shooting Gallery, Casa de Fritos / Rancho de Zocalo, part of Big Thunder Mountain, Carnation Gardens, three sets of bathrooms, Snow White Grotto, the "House of the Future" site, the Astro Orbitor, and a substantial chunk of the Peoplemover track. Just in the 1971 Hub. I want you to think about what the massive increase in ambition and scale that single area of the Magic Kingdom constituted for WED Enterprises in 1971. Keep in mind that these guys had the ability and expertise - the experience - to replicate any darn part of Disneyland they wanted. What they did with this experience was to create a totally new theme park specifically designed to minimize very specific parts of the Disneyland master plan. Magic Kingdom has no berm - they didn't need to block out a city, so why bother? Magic Kingdom largely slowly draws you into the various sub-areas of the park, gradually transitioning plantings, music, textures, and colors in ways which pass by you essentially subliminally. This is what I mean when I say that Disneyland and Magic Kingdom are aesthetically dissimilar - your basic assumptions about the way the place was put together have to be different. Magic Kingdom generally handles its transitory spaces with slow, subliminal, incremental changes, some sort of real life version of a cinematic fade. 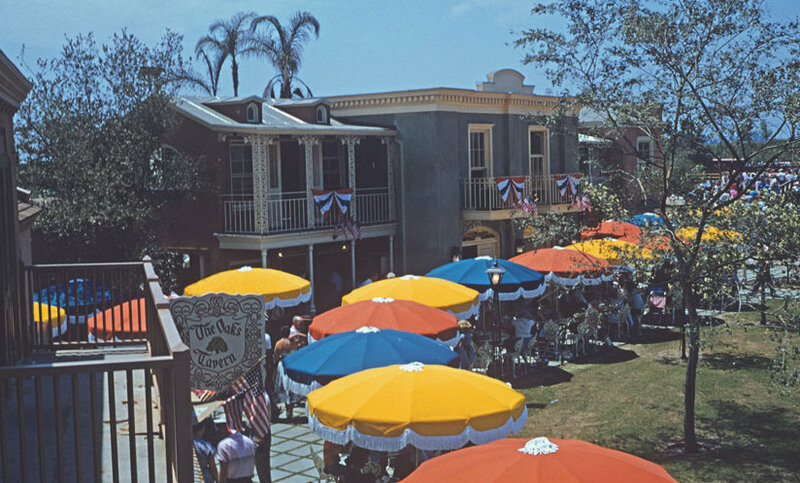 The part WED Enterprises chose to exclude, of all the things they could have excluded, are the moments in Disneyland where one set of themed design choices meets another in a very small space. I'm fascinated by those moments, partially because it was exactly that which was excluded with almost surgical precision from every Disney theme park that came after - every subsequent version builds on the 1971 park, not the 1955 one. Therefore, it must by definition be one of the things that makes Disneyland so charming - that thing they removed, that special condition. And if we are interested in drilling down past the years of built up rhetoric and regional squabbling and get nearer that thing that makes Disneyland special, we must engage this facet of the park. We must carefully observe and expose its workings. So, fasten your seatbelts, it's going to be a bumpy night. Does the Central Plaza have a theme? 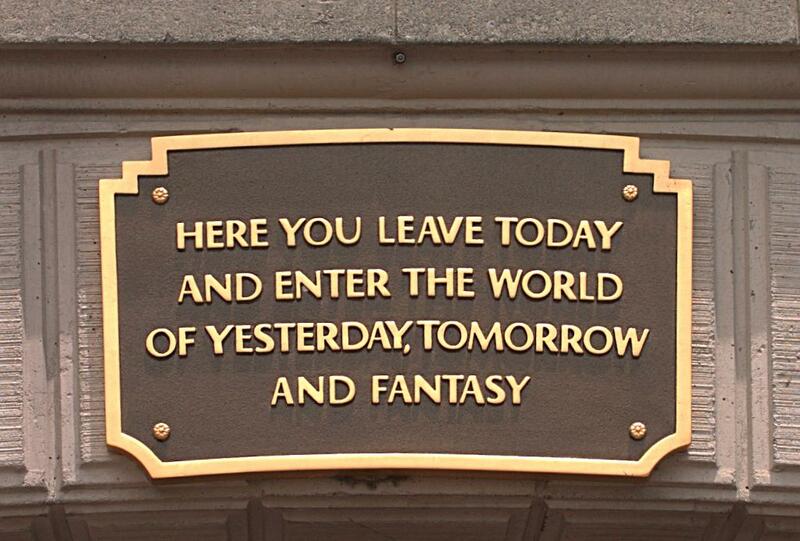 At Magic Kingdom, it does. It's themed to Main Street. The areas which do not carry the Main Street theme are presented across a body of water - the moat. Adventureland is over there, you must cross this bridge to get there. The Magic Kingdom conditions us to expect this by first presenting itself at the far end of a huge body of water - the Seven Seas Lagoon, a mile across - which we must traverse to get to it. We are conditioned to expect strange and fantastic things which await us across the water. This taps into more cultural traditions that can be counted. "Away, I'm bound away / Across the wide Missouri!" Disneyland laid the foundations for this, and of course it too has a moat - albeit one which does not wrap all the way around the plaza. The moat here serves a slightly different function, and the central plaza itself includes elements from each of the sub-lands standing easily one next to the other. 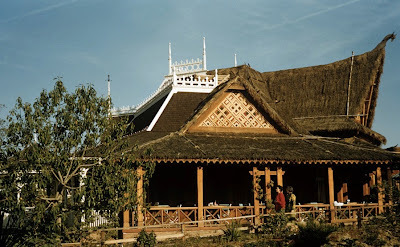 Disneyland generally achieves its' fantastical distortions by contrasting non-complimentary items - an African trading hut contrasted directly with an American frontier stockade, Bavarian castle, and Swiss mountain. It would only make sense in Disneyland. Therefore, I look at Disneyland's central plaza not as an extension of Main Street, but as a sort of vortex which has drawn elements of all of the various lands towards the center of the park - the vacuum at the heart of the tornado. This central position is now occupied by a statue of Walt Disney, which is perhaps poetically appropriate. It is a sort of thematic no-man's-land where any theme is appropriate, setting up the sense of fantasy through contrasting, dramatic juxtaposition. This is the point where Main Street hits Tomorrowland head-on, around the side of the Plaza Inn. Now: not a single Disney theme park is without awkwardness at the Main Street - Tomorrowland junction, so I'm not picking here, but what we have here is seriously a blank wall with some trees in front of it. But what kind of jerk looks at blank walls anyway? The Hub at Disneyland is a unique place to observe the most violent visual clashes of theme and idea. So what are we saying here - that Disneyland's central plaza is themed to no land? Or every land? I think it's both. The Central Plaza is actually the second land we encounter upon entering Disneyland, and as such it has a function unique to this park alone. We can think of it akin to the table of contents in a book: come here and you can expect this sort of thing. The ivy-covered terrace on the right is part of the Plaza Pavilion restaurant. The bamboo on the left is actually inside the waiting area for the Enchanted Tiki Room. In between we have this head. Now, it wasn't always like this. In fact, it isn't even supposed to work this way. Seeing this, one may be inclined to quip that she prefers the "Tiki-head-nailed-to-the-edge-of-the-wall" method which reigns today. What you're seeing here more closely resembles a movie set than a theme park - which makes perfect sense since this is the first theme park and it was built by Hollywood craftsmen. Harper Goff designed sets for Warner's Midsummer Night's Dream and Casablanca. Marvin Davis worked for 20th Century Fox. 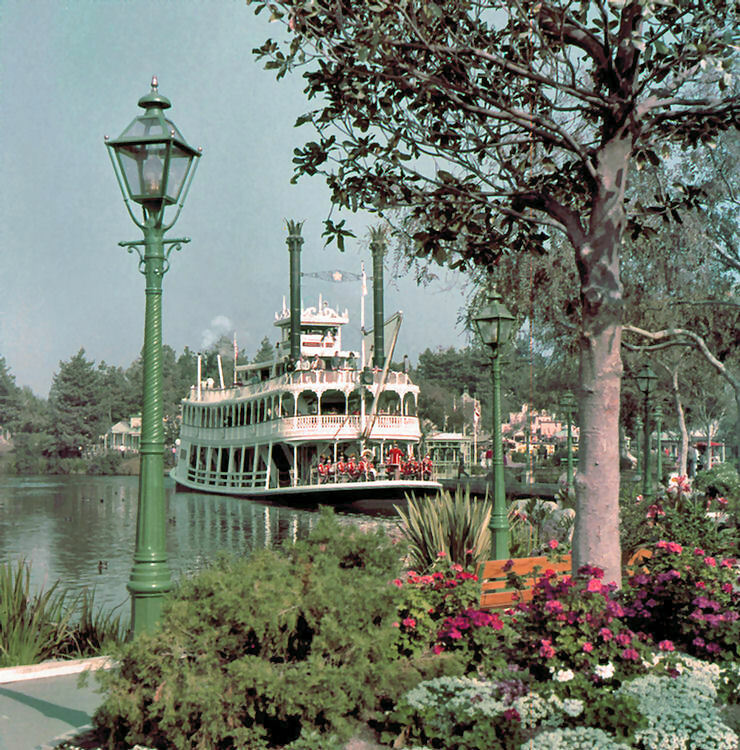 The key concept in film production design is the ability of the camera to exclude certain objects from view; Disneyland's early scenery resembles a movie lot more than a modern theme park. It would be several years before WED Enterprises learned how to design for the human eye instead of the camera eye. Back to the park today. Notice in the first vintage photo above how the area directly behind the arch is clearly Adventureland themed, but the area just to the right is Frontierland themed? It's still this way today. Walk straight ahead and turn left, all you see is Adventureland. Look right at any time, and you'll see Frontierland. Here's the spot in the park today where the two themes collide. It's the entrance to the girls' bathroom. 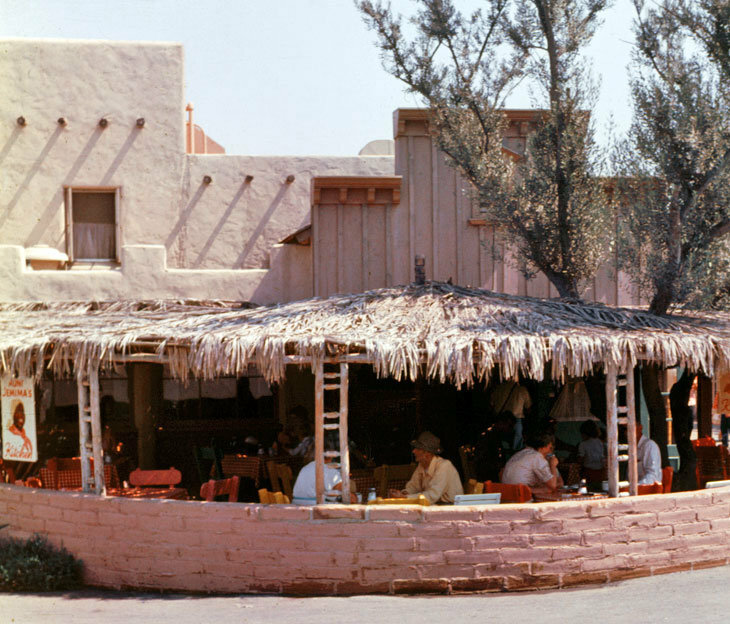 The green rocks on the left were added in the 90s as part of a general Adventureland refresh. You can see a hint of the brown rocks on the right which belong to Frontierland. The stockade fence to the right also hints at Frontierland. The top of the stockade fence. The lanterns can belong to either locality, but the brown clapboard siding to the right is absolutely part of Frontierland. Notice how the eaves under the roofs change from carved and ornate (exotic) to simple (homespun). Here's a reverse view of the same area from just inside Adventureland. With the backdrop of the green Adventureland rocks and foliage, the Western stockade fence and lanterns now look "exotic" and the framing Frontierland architecture absorbs the transition. This is a design for the eye, not the camera. The Main Street / Frontierland / Adventureland bleed-over points illustrate the defining feature of Disneyland's scenic transitions: the "Magic Window" effect. Gateways from one area to the next constantly appear, allowing us to leap geographic bounds. Jeff Crawford referred to this as the "airlock" effect between lands, and it was required due to the way the park grew together during its first few decades. What's that plaque that appears at the entrance to Disneyland? And why is it there? 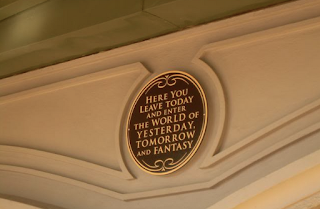 Ever notice how the plaque is intended to draw your attention to the function of the train station tunnel as a "magic window" into Disneyland? 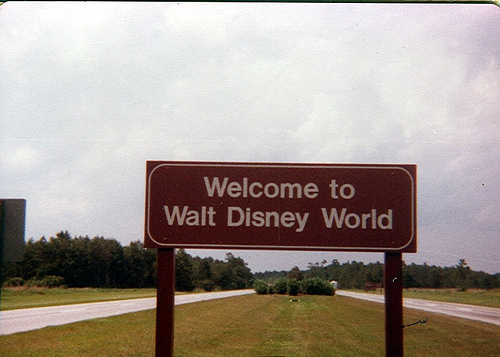 Let's turn it around: ever notice how The Magic Kingdom in Florida didn't originally have the sign? And how when Imagineering put one there in 2003 it looks pretty awkward? 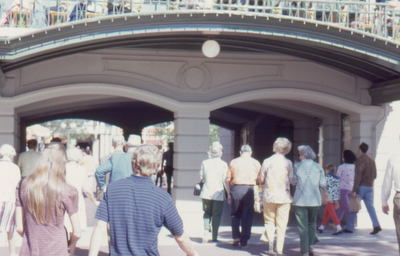 It looks awkward because it isn't supposed to be there; Imagineering didn't forget it back in the 70s. They probably left it out because they felt that they didn't need it; after all, they had bought miles and miles of property and forced everyone to drive through two-thirds of it just to park their car and cross a darn lake to get there. Disney didn't need to tell people they were entering a fantasy world; they already knew it. The entrance plaque is a keystone for understanding Disneyland's "magic window" organizing principle and how space is organized behind those points of juncture. Disneyland operates in methods similar to a cinematic cut, from one locality to another, and the effect is, at least partially, accidental. Magic Kingdom operates in a method most similar to a cinematic fade, and that was designed in from the start. Here's a fun intellectual game you can play at Disneyland: which land is the Matterhorn in? 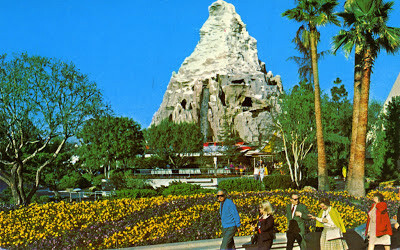 One of the most famous things about the Matterhorn is that it was "moved" from Tomorrowland to Fantasyland in 1971. This, more than anything, demonstrates its inherent flexibility. 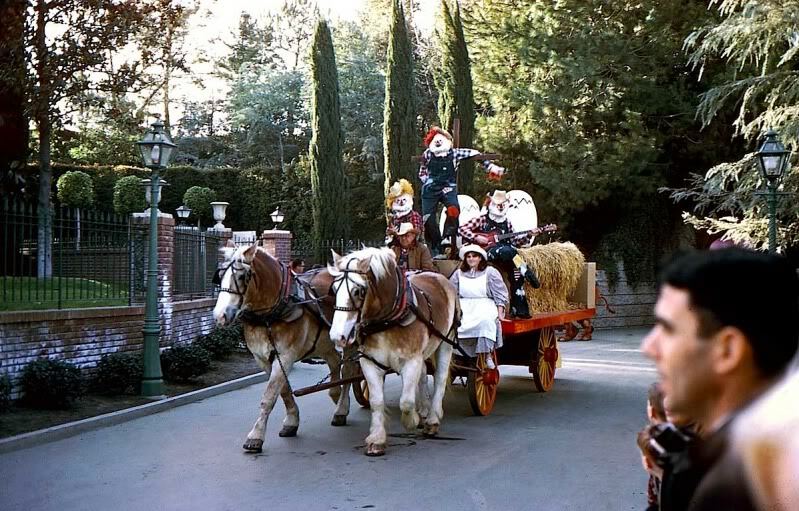 The Matterhorn was initially grouped around the number of attractions of indistinct locality: The Fantasyland Autopia, Submarine Voyage, The Motor Boat Cruise, and we could even argue for It's A Small World, which has never been a wholly appropriate fit for Fantasyland. The monorail, undeniably a Tomorrowland element, wraps around it. The bobsleds themselves more closely resemble rocket ships and in 1978 the attraction received clones of sleds then in use at Walt Disney World's Space Mountain. 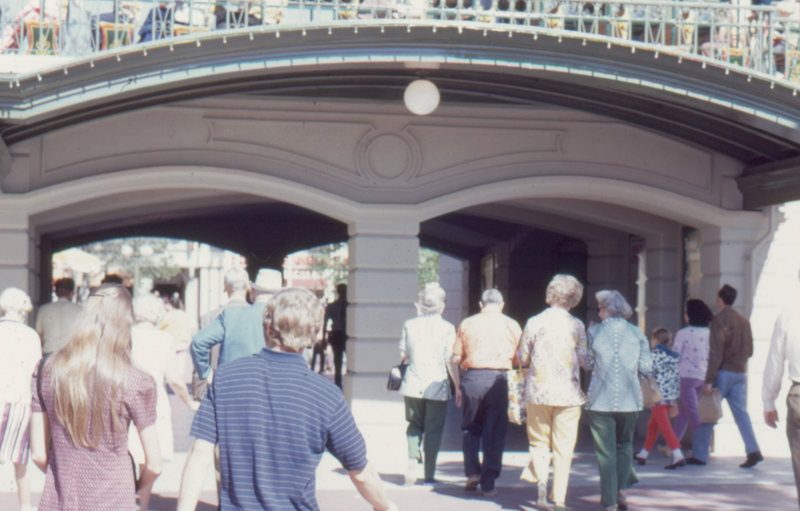 And the Skyway buckets, which disembarked in both Fantasyland and Tomorrowland, of course passed direct through it. 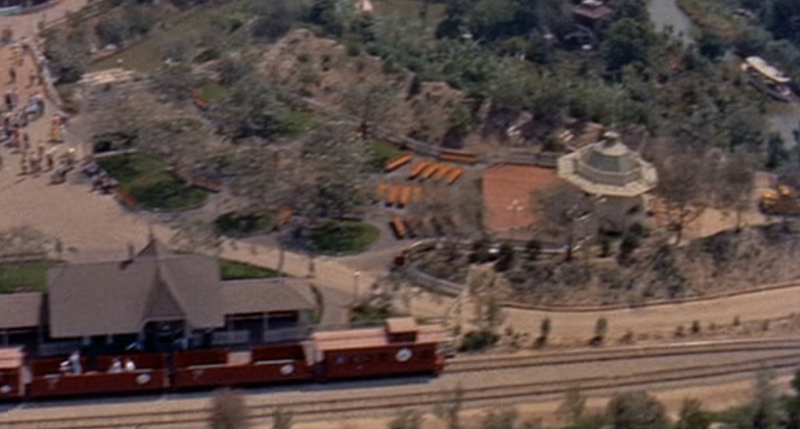 Yet it's a stone's throw away from both Alice in Wonderland and the Tomorrowland Terrace, and depending on whether one walks around the north or south side of the mountain she will experience very different visual elements. 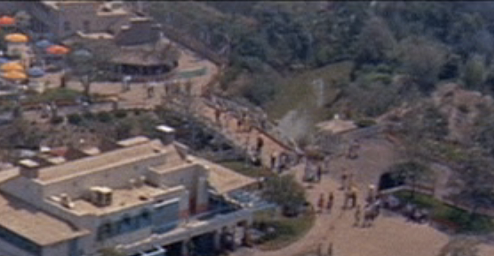 And just why was the attraction added to "Tomorrowland" in 1959 in the first place? Please choose for me, folks! During the 1978 refurbishment, a number of elements were added to the Matterhorn which perhaps more strongly than ever claimed it for Fantasyland. Reworked rolling fields and flowerbeds, charming footbridges over gurgling mountain streams, and Alpine lights and lanterns now set the scene as we walk around the base of the mountain, setting a bucolic middle-European tone which was very much a "dress rehearsal" for the New Fantasyland of 1983. And of course, with the addition of shimmering gems and the Abominable Snowman himself, we're very much out of the realm of science-fantasy and into fairy tale territory. This is another moment where Tomorrowland attempts to hide in plain sight with muted colors, blank walls and some trees, and the results can be called more charming than effective. None of these elements have any business being in the same proximity as each other. Matterhorn is one of those many things at Disneyland that ended up where it was due to space restrictions and because Walt Thought It Was Cool. And the Matterhorn is cool, very much so. It seems to belong to both Fantasyland and Tomorrowland, and it's simply such a massive object that it's like a huge block which screens one land from the other. This is themed design by obstruction; it's like a wedge that separates the two areas. Faced with a nonsensical juxtaposition of elements, we see here attempts to aesthetically blend three visually unrelated objects. The results are... mixed. So what does the Matterhorn fit in best with, Fantasyland or Tomorrowland? I think it's neither. 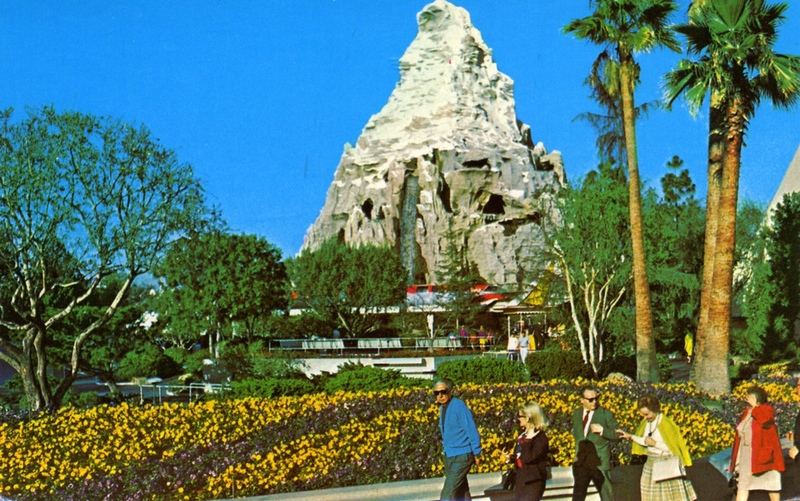 I like to think of the Matterhorn as being themed to part of the Hub, and in fact it forms a sort of second hub; walking its perimeter is one of the most satisfying scenic tours in Disneyland. What could have been a liability is turned into a seemingly natural part of an imaginative visual landscape. In 1955, each of the various areas of Disneyland was a little self-contained pocket - the various lands would each "dead end". This makes perfect sense from a movie back lot design perspective, but this was one of the earliest lessons learned by WED Enterprises when it comes to designing for people, not film crews. Some of these areas were opened up pretty quickly - such as the east Fantasyland dead end, which spilled out towards the train station and Mickey Mouse Circus within a year. 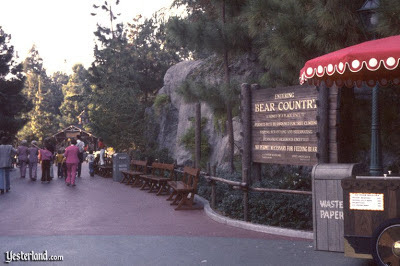 Others, such as connecting Frontierland to Fantasyland directly, didn't come about for decades and decades. 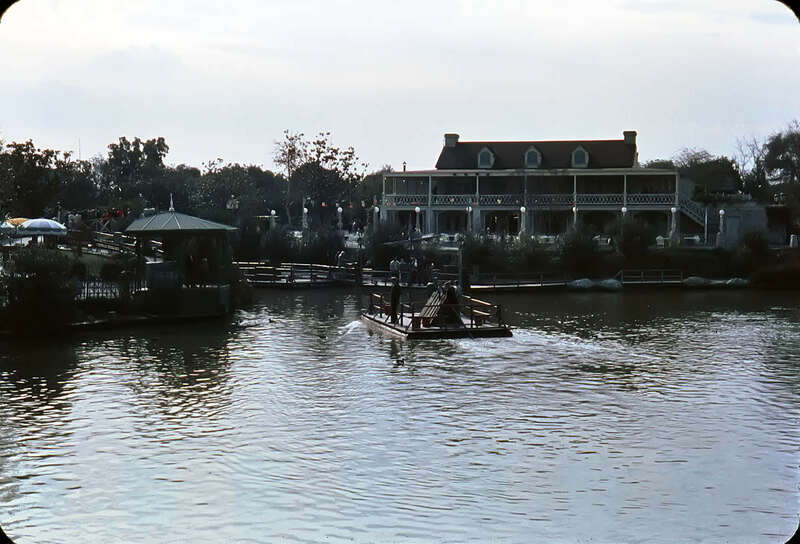 Notice how the bandstand was just a few yards from the Jungle Cruise behind an earthen berm... there must have been a lot of Dixieland audible in certain parts of the Jungle in those days! This simple connection created the original transition space in Disneyland, and it's worth looking at in some detail before we look at how it's used today. 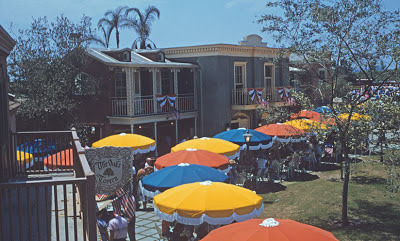 Now, New Orleans Square is always thought of as Disneyland's first new "land", but it's more rightly thought of as an expansion of an area that has always been there from day one: the New Orleans Street in Frontierland. 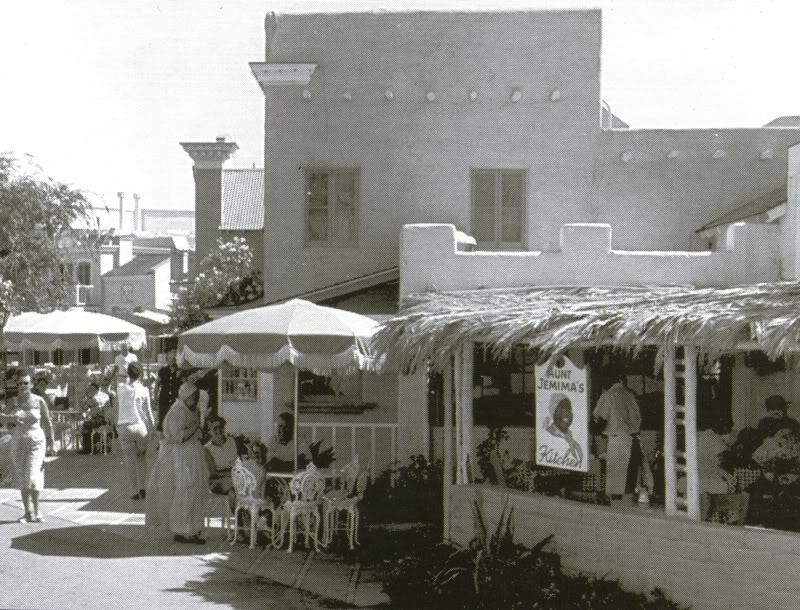 This meant that guests walking in Frontierland in the "Orleans Street" and on the Mark Twain would have perceived the street and Plantation House at the end of it as being in the "New Orleans" style while guests arriving at Frontierland by train would have seen only "Old West" style architecture. Riverbelle Terrace is the most interesting transitional architectural feature of Disneyland, and as such it deserves some extended consideration here, although to start I'd like to begin by playing games with... fences. 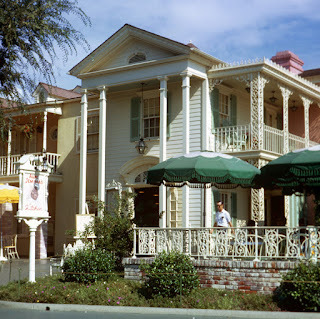 The nearby Stage Door Cafe sign visually integrates with Frontierland beyond it, but it's positioned at a pivot point in the area: behind it, the Frontierland visual vernacular continues towards New Orleans Square with a rough-hewn tree planter and crude fence even while gentrified plants and a white wrought iron rail are already transitioning us towards the "big city" just inches in front of it. 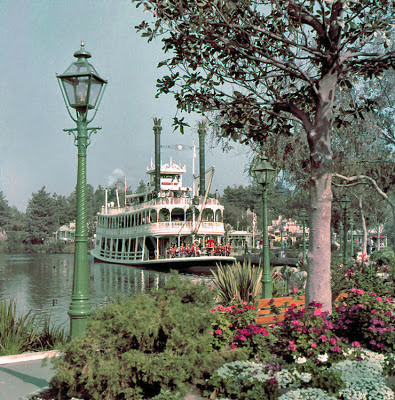 ....until the Frontierland rail fence terminates at a potted plant. I've been using the term "awkward transitions" rather tongue in cheek all this time because I think Disneyland does a remarkable job with a difficult situation, but this is one spot where I must admit that the Haunted Mansion / Splash Mountain transition is just plain sloppy. You can find more awkward transition spots in Disney theme parks - especially ones with names that end in "Studios" or "Adventure" - but those parks aren't nearly in the same artistic league. Once past Adventureland and on the "waterfront", the tropical elements are largely obscured by foliage, and the Pirates of the Caribbean, situated inside New Orleans Square but taking us to an exotic port-o-call, is an appropriate thematic transition. Recall that Pirates itself was placed in Adventureland in Florida and in a New Orleans subsection of Adventureland in Tokyo. All of these visual tropes and conceptual ideas are very malleable and blendable. And these earth tones and timbers visually transition us to the citified Golden Horseshoe, which sticks out far enough and is positioned on a wide enough corner to mean that the smaller, more rustic Frontierland is hidden from view. It's a sort of cinematic fade that takes several hundred feet that we experience with our eyes alone. So am I not saying that Disneyland's design is naive? No. The hand-built, human-scale, smushed-together effect is the "Disneyland Magic". It takes a sensitive eye to pick it out in later iterations of the "Disneyland-type-park" built by WED Enterprises and Imagineering, because they are more sophisticated designs. I've spent a long time here talking about the craft of cinema, of back lot sets and cameras, so I'll put it in cinematic terms. I'm sure many of us have had experiences where we watched a movie from several generations ago and scoffed at some sort of outdated camera technique or obvious special effect. This could be the use of camera irises in silent film or maybe something like the obvious model airplane in Casablanca or rear-projected driving scenes in Vertigo. We scoff at them because as films have continued to change, the tools available to filmmakers have allowed them to smooth out or paper over technical definicies which were accepted by audiences in their day but look much more prominent to us now. Disneyland is sort of like that. It was so cutting edge in its day that the subsequent evolution of this thing we now know to be a theme park means that its tricks, the moments where the illusions meet awkwardly, is very obvious to modern eyes. This is what creates the sense of cuteness, of charm. This is what I mean when I say that Disneyland is naieve: what it's up to is right out there in the open for all to see. It's a great place to start to learn about how theme parks work because what Disneyland does thematically tends to be very clear and easy to comprehend. But I don't think that just that aspect alone makes one thing inherently superior to another. The increased sophistication of something like Magic Kingdom or Animal Kingdom is, just like Disneyland, reflective of the era in which those parks were built. I enjoy the artistic aspects of those parks without finding them to be a threat to Disneyland's similar but also quite different excellence, just as I don't find Peter Jackson's CGI gorilla to be much of a threat to the legacy of the 1933 King Kong. On one hand, modern audiences tend to laugh at the effects in King Kong or Jason and the Argonauts, things that held me in rapt attention as a child as dazzling, seemingly magical expressions of technical skill. Yet Disneyland has largely not dated in the same way, and I think the secret is because even in 1955 the park was about nostalgia. You don't traipse 1955 adults down a fantastical recreation of what America was like in their childhoods for just no good reason. Disneyland never once asks us to believe that what it presents is reality, it has and will forever be intentionally retrograde, slightly hokey. I see we've come full circle, back to where we started, that special charm of Disneyland. If such a vastly complex work as Disneyland need be broken down into a simple summation of why it often seems to be the the definitive theme park experience, I don't think landing on "charm" and redefining it as "naive art" is all that bad. I've gone through and pointed out just a half dozen especially pertinent and interesting cases to me, but in reality there are legions of possible places in Disneyland where that essential "Disneyland charm" is still in evidence - some good, some not so good, but all characteristic of the place itself, all characteristic of "that unique existence of the work of art." Do you enjoy long, carefully written essays on the ideas behind theme parks, like this one? Hop on over to the Passport to Dreams Theme Park Theory Hub Page for even more! I look at blank walls sometimes taking a snapshot, and during restroom and food breaks from the continuous walking I see these transitions and stand there without words. Congratulations on this eloquent post about what others have dumbly seen. This post is truly amazing. LMK if you want one and I will create it for you. redtimmy at gmail dot com. 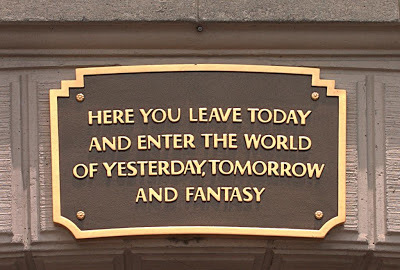 I think that the "story" of a tour through Disneyland was, roughly, originally intended to be a clockwise tour from the ancient -- in Adventureland (actually a nostalgic-look-at the ancient) -- through time, toward the future of Tomorrowland. Which is one of the reasons that trying to change the "future" into the Jules Verne era worked so poorly. And these transitions you discuss so ably are part of that wonderful trip through time. Always enjoy reading your articles! Thanks: I'm a theme park neophyte planning my family's first trip to Disneyland. My sister warned me that it would be too overwhelming for small children (2&5) but she's only taken her family to Disney World. After reading your article I'm reassured that not only will Disneyland be more age-appropriate but I will also find the experience interesting as I look out for the transitions you've described. An amazing and insightful analysis of what has been observed by thousands but only now explicated in detail. I would pay a lot for a guided tour by you of Disneyland's awkward transitions! I like your use of the word naive. As a long time Disneyworld visitor, I was struck by how toy-like Disneyland felt. As if Disneyland were a model train diorama that you walked through instead of a real place. While I understood the park was created like a movie set, I hadn't considered that at disneyland you are an actor while at Disneyworld, you are the camera. Your comparison of theme park transitions to their cinematic equivalents is particularly to me, and goes to a long way to explaining feelings I've had in comparison of the two parks discussed here. Even in cinema, where a "fade" might feel less jarring, aesthetically softer, and conceptually more pleasing; I often find myself drawn to the harsh juxtaposition of a hard cut. Perhaps my intuitive feeling (or taste, if you prefer) toward relegating these dissolves to the occasionally effective montage or narrative turn says volumes about my experiential preference of Disneyland over World. On another, very different level, I can appreciate the thoughtfulness and totality of design that allows for a more finessed transition between lands. Indeed, if one views each "land" as a narrative "act," these transitions become even more justified. I, personally, can't think of a theme park experience so linearly, as their defining aspect that appeals to me so deeply in contrast to other narrative forms is its participatory structure. Another, not wholly unrelated thought that comes to mind when reading your wonderful article is in regard to your astute comparison of Jackson's Kong to Kong '33. This, too, inspires a particularly affecting notion in me: as fascinating as these notions of optimal park design and aesthetic transition are to me, I have a feeling that beyond any such considerations, my instinctual preference for DLR may lie in something as base and quantifiable as sheer content. The experience of Disneyland feels a whole narrative. A complete experience. Magic Kingdom at WDW feels one cog of a larger machine; taken on its own, while dazzling in its aesthetic finesse, leaves a feeling of disproportionate content to presentation ratios. As if that polish has not been earned by the total experiences it offered. In the same way I may be awed by the technical wizardry and ambition of Jackson's Kong, I can't help but be forever wooed by the -- as you say, "naivety" of Kong '33. For in its rough, jittery, stop-motion, glamour, I feel the content of truth more potently housed in its narrative. As a film type myself, I do feel compelled to point out that I do prefer montage to fades, wipes, or the other tools of cinema commonly used to convey information, and I furthermore prefer montage in the hard-edged, Eisenstein style. Still, Magic Kingdom has a design integrity that Disneyland lacks, because it has changed frankly remarkably little in its 40 years in operation, and I find that intoxicating. Everything is in its place for very specific, quantifiable reasons. 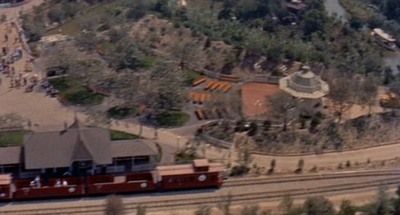 It's a very subtle design, however, and I think it takes a lot of experience with that park to start "seeing the pattern". Disneyland is far more obvious, which only enhances the already-present juxtapositional effect. Disneyland compensates for being an inferior design by being a superior theme park experience: there's more to do, and a lot of it, and what's there is often more texturally interesting than Magic Kingdom. But I think they key difference is that Disneyland is one of the most significant American media experiences of the 20th century, and Magic Kingdom just isn't. Disneyland is one of "those places" where everything about America comes together, and it's hallowed ground. That's why I think the King Kong comparison is appropriate. Once we get past that stuff, it pretty much starts to boil down to opinion. I grew up with Magic Kingdom and I find it has design meaning that Disneyland does not. That's probably personal experience filling in the gap, but it's me. I would like to encourage everyone reading this article and maybe my blog in general to look at all theme parks, Disney or not, with a fresh eye and no preconceptions. Every park or even public space has learning opportunities available. Thanks Nick for you perceptive comment and everyone else for theirs, too. This piece has been thus far a very satisfying experience for me. Really great post. Thank you for your thoughtful insights. "It's lovely to live on a raft. We had the sky up there, all speckled with stars, and we used to lay on our backs and look up at them, and discuss about whether they was made or only just happened." There is, indeed, something naively (and inherently) charming about things that "just happened," that grew organically, unexpectedly, somewhat randomly, over time. I'm not saying, of course, that Disneyland "just happened," but, compared to the Magic Kingdom, which was (mostly) designed as a single set piece at a particular moment in time, it did. One thing that struck me in reading your excellent analysis was the relative difficulty in expanding and changing the two parks. For Disneyland, this has always been an issue of space, more than anything, and for the Magic Kingdom, this has always been an issue of dealing with the careful theming and transitioning that the imagineers created. Think of Splash Mountain in the MK, which completely upsets the historical time and space (westward expansion) progression that happens from Liberty Square to Big Thunder Mountain. It's true, as you point out, that the transition from the Haunted Mansion to Splash Mtn in Disneyland is a jarring one, but in a park of slightly jarring transitions it's not as prominent. It's a whole different matter in the MK, where Splash slices into what is arguably one of greatest works of theming ever. When a thing is meticulously and subtly planned to perfection right from the beginning, it's much more difficult to alter it. As honored as I am to be quoted in this article, I am dumbfounded how you wrote this much without including the phrase "sensory tickle." Thanks as always for your always insightful comments here and elsewhere. Sadly the only Splash Mountain that really got appropriate placement was Tokyo's; the stateside versions are each off in different ways. The Disneyland version is simply too close to other park elements to not create an absurd juxtaposition, but once you get past Mansion the attraction and area has enough of a distinct identity to feel reasonably natural. Magic Kingdom's has a better overall placement - the site was chosen with that great view from the top of the lift hill in mind - but it has even less to do with what's around it. It also defaces a carefully conceived thematic unity across two areas. Since I can't help but feel that the theming run-up to Big Thunder Mountain was perfectly executed in 1980, anything else is an obvious afterthought. 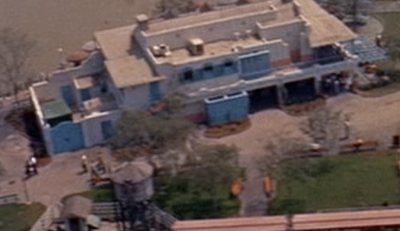 That photo of the tiny ankle-level brick detail between Adventureland and the Hub will haunt me. Glorious article. Thank you! Great article and I also liked Nick's comments about King Kong. One of the things that makes Jackson's version so tedious is that it adds in more spectacle without adding in more content. More dinosaurs and longer running time do not add up to a greater movie. One of the masterful things about the original is that it is concise. Nothing in it is superfluous. I have yet to go to WDW, which in itself says a lot. In that sense I can't judge it against Disneyland, but I can certainly explain why I haven't been interested in going. My own ranking of parks I have been to runs Disneyland USA, Tokyo Disneysea, Disneyland Paris, Tokyo Disneyland and California Adventure. Some are pragmatic reasons. Living in Western Canada, Disneyland USA is more convenient. A 3-hour direct flight and a nearby motel allow me to have a week-long vacation for two in the range of $1500. WDW is a transportation ordeal which, for the same amount of time, would cost more than a return trip to Tokyo or Paris (which we're doing next May) and about 4 times as much as Disneyland. Paris and Tokyo, both the cities and the resorts, have more that I want to see. I'm a very deliberate traveller who doesn't just go places because it's received wisdom that one ought to go. WDW killing the 20,000 Leagues sub ride was in itself enough to assassinate my interest. This will change, however, as my girlfriend is very keen to see New Fantasyland (what with Beauty and the Beast being her favourite Disney movie). Disneyland is in itself a thing I want to see, hearkening back to the fact that it is the original. While Disneysea and DLP are much more technically sophisticated (and have Verne rides), they still come in 2nd and 3rd because they are versions of Disneyland while Disneyland is Disneyland. It has historical cachet as Walt's original park and an essential piece of American pop-culture history, much like, say, Route 66, Fremont Street or Yellowstone. In terms of "authenticity", while some may deride Disneyland as inauthentic copies of things, it is 100% authentically Disneyland. Of course this flies a bit in the face of Imagineering's cliches. No Disneyland is not a museum, but it kinda' should be. I wish there was greater respect for the fact that things like the Classes of '55 and '59, the Tiki Room, Pirates of the Caribbean, the Matterhorn, and the park itself are historic sites. My girlfriend picked up on the charm of Disneyland when I took her for her first visit this past May. Her verdict on the park was a delight in how it distilled whimsy into a tight package. I actually wouldn't mind if it was a bit bigger in order to ease those transitions more, but Imagineering seems Hell-bent on going in the direction of Universal Studios, throwing Pirates, Marvel and Pixar anywhere they happen to have room, coherent theming be damned. James, interesting hypothesis! What I've read and tend to agree with is that Disneyland works more on an axis. The past of Frontierland contrasts against the future of Tomorrowland, and the nostalgic realism of Main St. contrasts against the imagination of Fantasyland while at the same time invoking childhood imagination (hense the castle being so utterly visible at the end of Main St.). 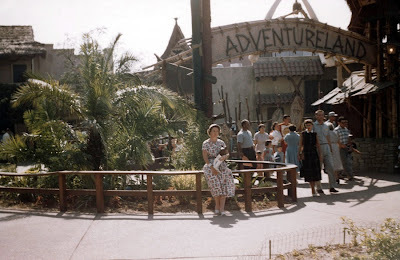 Adventrueland actually had no axial contrast until '59 when the Matterhorn and Submarines went in, providing the idea of exotic adventure both in the very recent past and the very near future. "Once we get past that stuff, it pretty much starts to boil down to opinion. I grew up with Magic Kingdom and I find it has design meaning that Disneyland does not." Having been born and raised in Sandusky, Ohio my first love has always been Cedar Point, and thrill with a small dash of theme. Thus my first trip to the MK and Epcot in the winter of 88, was a watershed in my development. And much like your last post Fox, that "Little Spark" left a huge mark still visible on me to this day (My plush figment from that trip is sitting next to me as I type this, on top of all my Imagineering books). However my trip first and only trip to Disneyland, during the 50th celebrations, still remains vivid in my head more then any other park visit, even though I been back to WDW 3 times, and have been to DL Paris. To me Disneyland is the test bed, that has evolved, and all of that evolution is visible, and mixes in unique and perplexing ways, that tickles the History and Design parts of me. 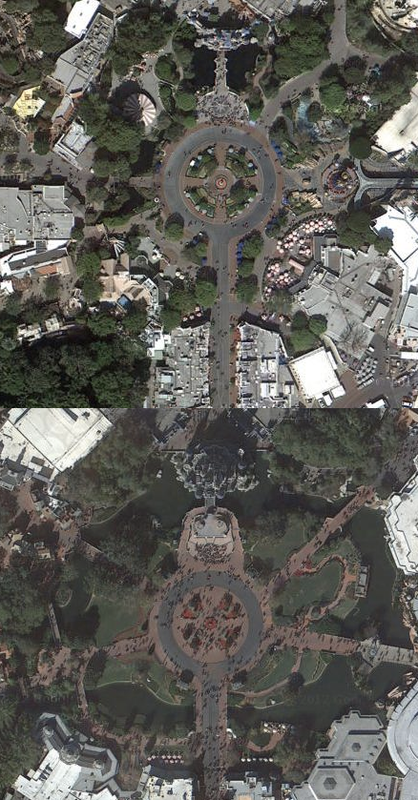 While the MK and the newer parks have remained remarkably untouched since they where built, compared to DL. Granted New Fantasyland is about to change a good percentage, and Epcot while seriously neglected inside the show buildings, and worsened inside some, physically it has remained much the same. The said can be said of the Studios and AK. At Disneyland the whole the history of elevated theme design is in front of you, and with the sprucing up of CA, even more so then ever. And with Imagineering right up the road, and Mouse HQ not far from there, it has always got the budget for maintenance and updates, that WDW should have always got. So for me the design meaning is far greater, for not only is it genesis, but also evolution. Its like seeing the evolution of man which took centuries, all in one day. It also has Indian Jones a que of such mastery, and a ride thats the closest to perfection of Eisner era Imagineering ( I have yet to go to Disney Sea). Despite your reticence, I think you'll get something out of WDW if you go with the right expectations. Epcot is a mess. MGM is hardly even as good as California Adventure. Since you've had experience at both DLP and TDL, both of which cobble together pieces of Magic Kingdom, I think that will be more of the same for you, although MK is the very last Disney theme park that has that slightly naive sense of design that was studiously flushed out of TDL and DLP. Animal Kingdom is unlike anything else and if you take the time to go through it slowly and really study it critically, it has many rewards. But honestly the real thing you should be doing at WDW is all the stuff the other resorts don't have. Take the monorail to the Polynesian for lunch. Take a boat out on the Seven Seas Lagoon. Go to the campground for the sing-along and movie. Go walk the Boardwalk and Yacht Club. Take a nice long twilight boat ride down the Sassagoula. Try an expensive Epcot restaurant. That's the real thing that separates the Florida complex from the others. If you don't take advantage of all the stuff that isn't in the theme parks, you're cheating yourself. Oh, and: first time going to the Magic Kingdom, park at the TTC parking lot and take the ferry boat across the lake. This is crucial. DAK is the park at WDW that I'm most curious to see. Working in the museums and heritage field - and one of my jobs being in a zoo to boot - I'm interested in seeing serious themed design applied to the zoo environment, and how it then navigates the zoo-theme park breech. They might have sold me on a top-of-the-line dining plan too if the "all the tours you can eat" offer included the safari trek. I love how your blog take one aspect of the parks and makes me never see it the same way again. These DL posts are definitely different for me since it's more familiar. Whenever you post something new it's always a treat. David Koenig didn't mention that zinger about WDW being a photocopied Disneyland in "Mouse Tales", it was "Mouse Under Glass". I'm just saying. One of the major considerations of any contemporary architecture - especially one that has to deal with nearby structures and environments - is juxtaposition. Building materials (apart from glass or other devices that enable layering such as fences) favour the hard cut; how a designer gets past those limitations is where the art surpasses the science. Disneyland is supreme in its fantastical transitions between lands but, architecturally, the problem of solving joints is one that can be seen almost anywhere. Just look around your neighbourhood - you can see this architectural dilemma played out for good or bad again and again. One thing I miss that they changed at the Frontierland/Adventureland bleed area at Disneyland, was the older sign that labeled the Woman's restroom. There, it was appropriately themed to Frontierland (put on the actual stockade wall you can see in the photo), with a bustled lady in 1880s wear. It worked quite well in Adventureland, though... as the silhouette also looked a lot like Jane Porter. Bridged that gap very well.